Johannesburg’s glorious winter days always remind me of the benefit of living here. The early mornings and nights challenge my Durban blood, but fortunately the best household investment I ever made was the wood stove fireplace in the lounge, which has been working overtime of late. You see, I’ve been ‘camping’ in the lounge these past few months because I decided to renovate my home-office before the ceiling fell in. My Deco desk looked perfect and I became so used to being there it took me until the end of June to reluctantly occupy my office again. Well, there was another reason too. In my previous newsletter, I mentioned the loss of our miniature Schnauzer. Just months later, our giant went the same way. For a household of dog lovers, it was a bruising time and it seemed we’d delay acquiring any new pets. But fate has a way of intervening and we found ourselves driving to Bethlehem one Sunday in early June where we met the now-named Becky among a pack of fully grown giant Schnauzers with puppies underfoot, standing (running?) their ground. It didn’t take Becky long to take over our hearts and the house and I’m still trying to take control. Would I be boasting to say my charge is the star of the puppy class at Furbabies in Auckland Park? I was told this by another owner – well, not in so many words, you understand, but she said how good Becky was at everything. Okay, I admit ‘everything’ in this instance was an obstacle course where one lures the pups with liver cookie treats. Becky was totally unfazed by hula hoops, a bath filled with balls and a wobbly platform in her quest for the end result. And she set a record that day running through a tunnel to claim her prize. At home I’ve yet to be that effective. With arms resembling pin-cushions, I’ve decamped to my office and Becky is banned. Happily, she was the model crowd-pleaser at the giant puppets’ parade that launched the June 30 Fệte de la Musique on 7th Street. Contentious as the street festival was in the build-up, it was a well-run event that brought some buzz back to Melville. With the postmortem not in at time of writing, as a dedicated tweeter I thought it fitting to let a few random Twitter commentators be the judges. My search revealed only positive comments. Darren Smith ‏@DazMSmith#festival ~ 7th Street. Melville #FêteDeLaMusique … multicultural Jozi at her best! cheryl vilakazi ‏@zottyzuI’m loving #Melville right now. It’s like the good old days. Cllr Forsythe ‏@DAWard87 The vibe in #Melvilleis so chilled & lovely! So wonderful to see 7th street brought back to life! Well done to the MRA & Alliance Francaise. Phindile H™ ‏@Zoadora#fetedelamusique did me right. Thank you #Melville, you made Jozi come alive in all its realness. Chantal Stanfield ‏@chantalgal‘Fete de la musique’ in Melville last night was amazing, such a great vibe in my neighbourhood! Spotless this morn! Lastly, I’d like to thank designer Alan Langbridge and artist Simon Parkin for bringing new life to the Melville News masthead. In the spirit of this publication’s existence, both have contributed without payment. I love the look and hope you agree. Melville News is delighted with our new masthead. The introduction of a watercolour of Melville Koppies by well-known artist Simon Parkin was the master stroke of designer Alan Langbridge. 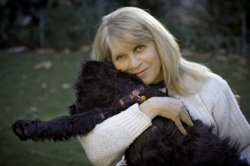 Alan’s long-standing friend and colleague, Suzanne Brenner, reveals his modus operandi. I’ve known Alan since 1983 when he phoned to request an interview at Darling magazine, where I was the editor. On the appointed day, he tells me now, he was nervous enough to require a little Danish courage – generous quantities of Aquavit –which I must have failed to notice. At the time, Alan was art director of Pace magazine but he was ready for a change and he informed me I was too – well the magazine at any rate. He must have been convincing because soon his creative signature was evident, as was his presence as a member of the small staff. Neither of us was a pushover, but we found common ground about the look of the publication. It’s hard to believe that relatively recently we had no computers and with our head office in Durban, all layouts had to be sent for printing via the overnight bag. Any changes required the same back and forth archaic transport. To the best of my knowledge, we never missed a deadline. A year or so ago, Alan sent me an unsolicited suggestion for a new-look Melville News. Once again, I wasn’t aware I was ready to make the change, and once again Alan won the day (well, eventually). And just as I was giving it the thumb’s up, he informed me he’d re-thought the concept to include his cousin Simon’s painting, which he’d received as a gift. I loved the idea immediately. I’d met Simon through Alan and later as a TV producer on the SABC’s arts programme, and I have always admired his work. Simon’s drawings, watercolours and oil paintings have been exhibited at galleries in South Africa and abroad. Recently, he’s been involved in a project painting historic South African schools and has been commissioned to produce several illustrated maps for game reserves. Simon also accepts private commissions. 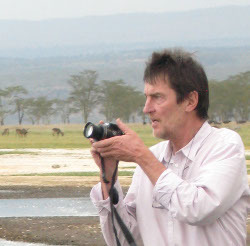 See Simon’s work at www.simonparkin.co.za . Alan Langbridge Design or ALD was established 23 years ago “at the beginning of the computer-driven,graphic design revolution”. Over the past two decades, it’s expanded into business, consumer, and above and below-the–line print and electronic media. You can contact ALD at langbridge@iafrica.com . 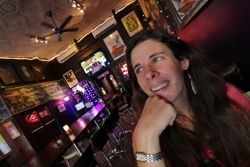 Heather Mason is a 37-year-old American writer, photographer and blogger living a quirky life in Melville. I’ve been thinking that I need to address this issue. I’ve lived in Melville for less than two years. It is nearly impossible for me to walk up 7th Street — any time of day, any day of the week — and not run into at least three people I know. Not only people I know, but people I actually want to stop and chat with. Because generally, people in Melville are unpretentious and cool. I’ve never felt this way about any other place where I’ve lived. 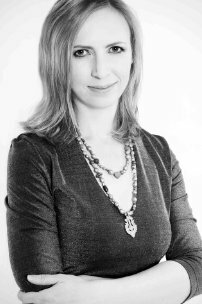 Joburg born and bred, Sarah Britten writes social media strategies for clients. She’s also a blogger, author, journalist and artist, working in lipstick to produce paintings of the Joburg skyline. Here she reveals the downside of blogging. We often like to rhapsodise about the impact of the internet on the act of reading. But one thing above all else has made the experience of reading an online column, or an opinion piece, or a news item, radically different from reading the same thing in a newspaper, and it is this: the reader can respond, then and there, in real time. And once that response is posted, it becomes part of the original article. The reader is just as much a part of that text as the original author. I’ve been blogging for more than six years. For someone like me to admit that I don’t read what people write about what I have to say is sacrilege. That’s the whole point after all: the back and forth, the cut and thrust. So what’s my excuse? I used to read the comments on my blogs. That was always part of the pleasure of blogging. But after a while things changed. The comments got personal. Nasty. And because thanks to a tough few years I’d become so fragile, I found them difficult to handle. I know I sound like a complete wuss, but it got to a point where the opinions of random anonymous strangers were distracting me from work, making it difficult for me to sleep and triggering massive existential angst. The comments were bad for me – quite literally. So, in a world in which we’re supposed know exactly what’s going on and exactly what everybody thinks, I’ve decided that shutting out the opinions of readers is the only way to survive. I still blog, and they still comment. But knowing what they have to say about me is something I’ve learned to do without. Ignorance might not be bliss. But it’s a whole lot easier to live with. Christine Pretorius is a collector of beautiful things. She likes nothing better than sorting the wheat from the chaff at her favourite charity shop, Bounty Hunters. I confess I’m a bit of a magpie when it comes to the decor in my all-white house, which provides a neutral backdrop for my “collector’s items’. I love it when visitors chez moi enter the dining room and focus on the ’50s frock hanging on the wall. “Where did you get that fabulous dress?” they inevitably ask. And in the kitchen, when they spot the Victorian jelly mould which is still fully functional, they frequently exclaim: “Goodness, my granny had one of those.” The source of both these much-loved objects is Bounty Hunters. 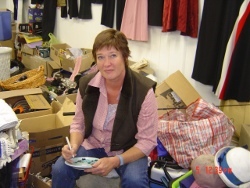 Gail Millard (below) is the magician who started Bounty Hunters in Melville in 1997, miraculously turning hand-me-downs into sparkling gold for those in need. The shop supports 30 charities with beneficiaries including Animals in Distress, Earth Life, the Johannesburg Association for the Aged, Free Me, and the Twilight Foundation. Although most donations to the shop are books, clothes, toys and kitchen utensils, the oddest contributions do sometimes get through the cracks. Without hesitation, Gail reveals the worst to date was a Porta-Potty complete with contents! Unsuspecting bargain hunters are often taken aback to find a clowder of cats among the clutter, but they’re not for sale. Gail also runs a homing project for our feline friends and I never leave Bounty Hunters without stroking at least one of the kitties, always curled up in the cosiest of spots. Bounty Hunters recently moved from Main Road to bigger premises in Fourth Avenue, near Seventh Street. Visit Gail and her team to explore the options. Donations of surplus goods are always appreciated. “People often say to me, ‘Oh you are so lucky you have such green fingers – I can’t get anything to grow.’ “Well, I wasn’t born with green fingers,” says Jane Griffiths, gardener, author, TV producer and regular Melville News contributor. When I first began growing vegetables I knew nothing. I learnt as I went along, reading books and magazines, observing my garden and learning from my successes and mistakes. In the process I have realised that the most essential tool you can have in a garden is knowledge. The more you know about your plants and their environment the better off you and your garden will be. When we garden, we tap into the magic of creation itself. We become attuned to the cycles and seasons of birth, growth, abundance, senescence and death. Living in the city, it is easy to lose touch with essentials. Becoming a gardener changes that, as rainfall becomes significant and the waxing and waning of the moon important. Through gardening we grow increasingly in sync with our natural environment. In our fast-paced, specialised society we have become accustomed to turning to ‘the expert’ whenever we need help – whether it is with our bodies, our computers or our gardens. Part of becoming more self-sufficient is empowering ourselves with knowledge, in this case knowledge of plants, soil, and cycles. One of the main things we need to understand about plants is that they are co-conspirators in the vegetable plot: They want to grow. All we need to do is create the optimum environment which will invite Mother Nature in, to do what she does best. Organic gardening means creating a balanced environment, which involves many factors: soil, water, climate, plants and a variety of living organisms. Healthy soil, enriched with plenty of organic matter, results in billions of micro organisms. The greater their population, the healthier and more bug- and disease-resistant our vegetables are. Above ground, the more diversity and variety we create, the more beneficial insects are attracted to our gardens, performing vital predatory and pollinating functions. Part of becoming an awake, aware organic gardener is gaining as much knowledge about your garden and plants as possible. The best person to get to know your garden – is YOU. If something is eating your plants, find out what it is – dig around in the soil at the base of your plants, look under leaves, go out into the garden at night with a torch. The better you get to know your garden and the more attuned you become to your environment, the greener your fingers will grow. Jane Griffiths is the author of the best selling Jane’s Delicious Garden, and Jane’s Delicious Kitchen with photographs by Jane Griffiths and Keith Knowlton. Both books are published by Sunbird Publishers, a division of Jonathan Ball Publishers. Fajeria Khota has been tempting taste buds with her home-cooked Indian meals for years. 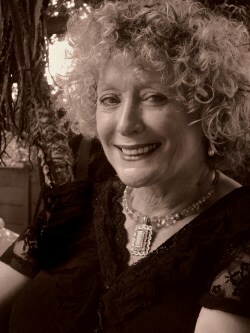 Suzanne Brenner, one of her customers, shares a secret. 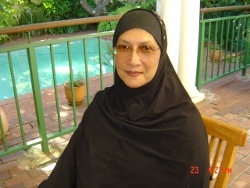 I can’t remember exactly when I first sampled Fajeria’s food, but if memory serves me it was at author, guesthouse owner and local resident Heidi Holland’s home. That’s when the penny dropped that it was the perfect way for the working person to entertain friends. I followed suit for a birthday lunch and thus began a long-term relationship with Fajeria’s famous curries, albeit on an irregular basis. It’s easy as pie, or whatever the Indian equivalent is, to place one’s order. Call Fajeria to discuss the menu, as there isn’t a formal one to consult. Her repertoire, as it were, matches one’s need and she’ll recite some options: Vegetarian, beef or chicken curry with basmati rice? Biryani? And how about some naan bread or pappadums? Fajeria’s reasonable prices include delivery in large pots which simply have to be reheated and are collected at everyone’s convenience. Fajeria also caters for cocktail parties, so ask about her selection of platters. (Warning: Fajeria’s quantities are substantial, but keep well in the fridge or freezer for later enjoyment. )Phone her on 011 830 0319 or 084 680 0359. Three years ago residents of the Waterval region, which includes Melville, welcomed Pikitup’s experiment to separate refuse at source. In the absence of affordable and attractive bins for the bags, Nina Venjakob of Out of the Box saw an opportunity to meet several needs. 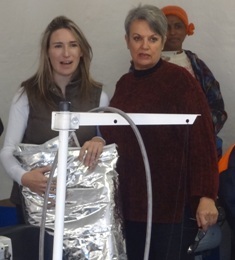 When Nina met Lise Kuhle (on opposite side in the photo), she immediately saw synergy between her company and The Recycling Box, which produces the so-named bins as well as other commercial lines such as laptop bags, shopping bags and geyser blankets out of recycled and eco-friendly materials. To meet increasing production demands, Lise was seeking a dependable workforce. Nina’s brainchild, Out of the Box (OTB), teaches skills to people who cannot find jobs. “With basic skills, we enable many to generate sustainable income by starting their own small businesses or byimparting their newly learned skills to others,” says Nina. Nina immediately realised she could convert Lise’s need into OTB’s opportunity. Lise depends on people with specific abilities to manufacture her products and Out of the Box services that need. “The bins, or recycling boxes, allow you to deposit separated items directly into one of our colourful receptacles in your kitchen without being an eyesore,” says Lise. “It’s an awesome project,” adds Nina. Out of the Box offers courses that include literacy, sustainable gardening, catering, computer literacy, woodwork and glass sandblasting. Based in Germiston, OTB welcomes visitors and regularly hosts arts and crafts fairs to raise funds for skills training and job creation. 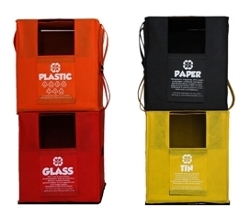 For more about OTB or to order bins, which are priced between R190 and R250, go to http://www.outofthebox.org.za/or phone Nina on 083 583 5383. SELLING YOUR HOUSE? It’s a buyer’s market so why not give yourself the best chance of reaching your target selling price? For a small fee, professional stylist Amanda Liquorish will work with the owner to show your house to best advantage. You’ve seen makeovers on TV programmes, now call Amanda on 076 112 5377. UNFURNISHED HOUSE SOUGHT TO RENT as soon as possible by a professional couple. Preference for Melville, Auckland Park or the Parks. Phone Peter on 081 324 7310. Excellent tenants. Ref: Suzanne Brenner.